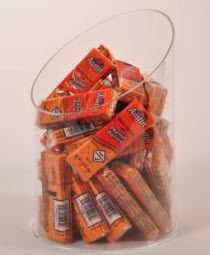 The tall Angle-Cut Top Candy Container is great for those hard to place larger wrapped food items. 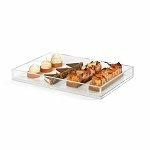 This acrylic container also works well for showing a large amount of smaller items. The display possibilities are nearly endless with this bulk food container. The wide angled top makes it easier than ever to select and purchase your product. Create a stylish display by placing an assortment of products inside this acrylic bin. Snack food containers make wonderful displays and help boost impulse buys when placed at the checkout counter. 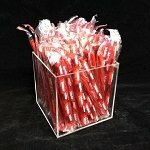 Order your tube shape candy containers today.